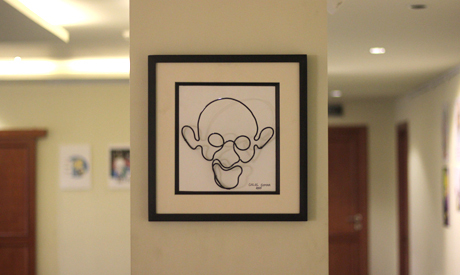 Two walls of a large hall in the Maulana Azad Centre for Indian Culture (MACIC) are decorated with cartoons representing Mohandas Karamchand Gandhi, commonly known as Mahatma Gandhi. On display we find a large selection of caricatures representing one of the biggest social, political and spiritual Gurus of all time, depicted in full or just a face. Titled ‘Gandhi through Eyes of Egyptian Cartoonists’, the exhibition opened on Sunday 4 October and is scheduled to continue until 15 October. 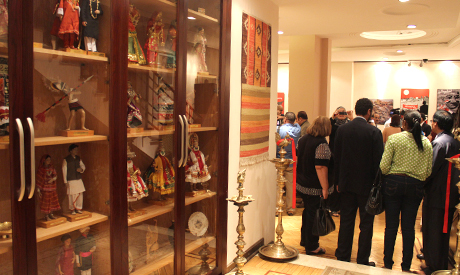 We learn from the notes accompanying the event that the exhibition was launched as part of an extensive collaboration between the embassy of India in Cairo and the Egyptian Caricature Society. The exhibition’s timing is not coincidental: on the one hand, 2 October marks Mahatma Gandhi’s birthday, on the other hand, the same date was designated as the International Day of Non-Violence by the UN General Assembly in 2007. ‘Gandhi through Eyes of Egyptian Cartoonists’ includes a selection of caricatures by some of Egypt’s most prominent artists, such as Adham Lotfy, Emad Abdel-Maksoud, Taha Hussein, Mohamed Effat, Fawzi Moursy, Omar Seddik, among others. This is not the first time that Gandhi has been a subject of an exhibition and other events organised in Cairo. Looking at the most recent history, we can recall an exhibition held in May 2013 titled ‘Did you sense the spirit of Gandhi in Tahrir Square?‘ at El-Sawy Culturewheel, which compiled works by artists from Egypt, India and African countries, linking Tahrir Square’s revolutionary events and Mahatma Gandhi. In October of the same year, the ‘Spirit of Gandhi in Egypt‘ exhibition presented some of those posters in addition to the Gandhi cartoons at MACIC’s old premises in Downtown Cairo. Several of the cartoons presented there were signed by the same names as in the current exhibition. 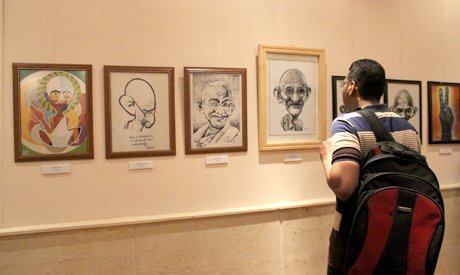 ‘Spirit of Gandhi in Egypt‘ was followed by ‘Faces and Features’, held one month later at the same location and displaying an array of cartoons and caricatures of remarkable figures from Egypt and India, naturally with Gandhi among them. In September 2014, the Indian embassy celebrated the release of the Arabic version of Gandhi’s Outstanding Leadership, a book by Nazareth, India’s former ambassador to Cairo. As Gandhi remains a recurring topic of many cultural events, India’s strong presence in Egypt is palpable throughout the whole year; from the Indian troupes’ participation in the International Samaa’ Festival for Spiritual Music and Chanting and in the International Festival for Drums and Traditional Arts, to the India by the Nile festival fully dedicated to the country’s culture, as well as from individual events that bring India’s artists to Egypt to photography and painting exhibitions. ‘Gandhi through Eyes of Egyptian Cartoonists’ displays content which, though it includes many new works, still echoes the same conceptual aspect of previous exhibitions held by MACIC. However, putting the timeless figure of Gandhi in mind, one can presume that this exhibition aims at re-establishing – and strengthening – the already existing practice, and underscores the ongoing cooperation between the Egyptian Caricature Society and the Indian Cultural Centre. Still, without delving into the exhibition’s content, ‘Gandhi through Eyes of Egyptian Cartoonists’ raises questions related to the execution of the event, a factor which in most aspects makes us remember and mourn over the loss of MACIC’s old location. Back in 2013, MACIC operated in breathtaking premises in Downtown Cairo, a location that was proudly — and justly — promoted as home to Indian culture in Egypt since the 1980s. It was in this cosy, two-floor space that one found shelter from the sounds of a busy Talaat Harb Street, visited the exhibition space, spent calm hours at the library, attended film screenings, courses, lectures and seminars offered by the centre. It was there that the visitor was welcomed by two sculptures: one of Maulana Abul Kalam Azad (1888 –1958), an Indian scholar and political leader who kept close links with the Arab world, and a bronze bust of Mahatma Gandhi, both inviting to the exploration of the unique haven of India in the heart of Cairo. The old walls, a corridor where the watchful eyes of dozens of dolls dressed in a variety of traditional Indian clothing followed the guests in silence, and stairs that screeched under each step padded the space with warmth of history and culture. But the idyll came to an end in February 2015, when the Indian authorities in Egypt announced the closure of the Downtown premises and moved to its current location in Zamalek. Today, MACIC and the Indian Consulate (previously located at another spot on Talaat Harb Street) are located at the Abu El-Fida Building, covering the whole second floor of a 12-floor building made of glass and steel.